In a 2-1 vote, the Third Circuit Court of Appeals reversed a district court ruling in favor of EA Sports, finding that the publicity rights of Former Rutgers football player, Ryan Hart, were violated by depicting Hart in the videogame NCAA Football in 2004-06. The decision is a step forward for collegiate players seeking compensation from the exploitation by the NCAA and its licensing partners. The suit highlights the inability for players to receive compensation even after they have left college and NCAA eligibility rules no longer bar them from receiving payment. The decision is step backwards for free speech advocates who seek clearer and more consistent protection from claims of publicity rights when celebrities and athletes are depicted in communicative works like films and video games. While the decision provides a thoughtful roadmap through the various legal tests applied to publicity rights, the court’s application of New Jersey law is at odds with the same test’s application in California. This will likely lead to increased confusion and more rounds of litigation until new statutes are enacted or cases decided. Seeking to apply the best balancing test between the First Amendment and state publicity rights, the court reviews and rejects both the “Predominant Use Test” and the “Rogers Test.” Under the Predominant Use Test, the Missouri Supreme Court held that “[i]f a product is being sold that predominantly exploits the commercial value of an individual’s identity, that product should be held to violate the right of publicity and not be protected by the First Amendment, even if there is some ‘expressive’ content in it that might qualify as ‘speech’ in other circumstances.” Unfortunately the Missouri Supreme Court then treated a comic book as such a commercial product and found the use Tony Twist’s likeness a commercial misappropriation when transformed into the evil Anthony “Tony Twist” Twistelli. The Third Circuit correctly rejected this application of such a test. By our reading, the Predominant Use Test is subjective at best, arbitrary at worst, and in either case calls upon judges to act as both impartial jurists and discerning art critics. These two roles cannot co-exist. The Third Circuit similarly rejected the Rogers Test, which relies on trademark considerations. The application of the Rogers test to the content of a work almost leads to a finding of free speech, although the content would violate the test where the content was really an advertisement. For example, where the paid ad were an advertorial, a newspaper column of paid content, or in the case of a TV episode which was little more than an infomercial for a forthcoming product. In these cases the content was also a disguised commercial advertisement for sale of goods or services. Unless the content were an advertisement, the Rogers Test would permit the publisher to succeed over the publicity rights. Tee-shirts depicting The Three Stooges to be insufficiently transformative to protect the free speech rights of the artist. Comic books depicting Johnny and Edgar Winter as “villainous half-man, half-worm creatures, both with long white hair and albino features” sufficiently transformative to be free speech. Video game depicting musician Kierin Kirby sufficiently transformative to protect Sega’s free speech rights to incorporate her image in a video game. Avatars depicting No Doubt in video game Band Hero were life-like depictions and therefore violation of contractual limitation on publicity rights was a violation of those rights. The Third Circuit applied this transformative test and in a 2-1 decision found that the literal depiction of Hart’s avatar was insufficiently transformative to protect the free speech rights of the video game makers. The dissent emphasized the video game’s creative and transformative elements as a whole rather than the particular depiction in isolation. Unfortunately both the majority and dissent ignored this highly inconsistent and arbitrary nature of the Transformative Use Test. Like the Predominant Use Test rejected by the court, the application of the Transformative Use Test remains a rather arbitrary rule. Since both the Hart decision and the Kierin Kirby decision were summary judgment decisions, the courts were basing their decisions on stipulations that the individuals were depicted in the games. More troubling, if the First Amendment decision of Brown is to be given full effect, then this analysis should apply to television coverage of sports as well. If Hart’s image is exploited in a video game, is it not also exploited when broadcast? The NCAA cannot make any claim to the publicity rights of its former players or players who are no longer eligible under its rules. (Whether the nation’s colleges should be able to strip undergraduates of their privacy and publicity rights as a condition of college eligibility is a broader question best left to a different analysis.) I cannot distinguish between’ Hart’s avatar and a Tina Fey sketch on Saturday Night Live depicting Sarah Palin. Frankly, judges should be empowered to make that distinction either. I have advocated for a different outcome, based more closely on the Rogers Test of the Second Circuit that emphasizes that publicity rights only exist when the name or likeness is used for a commercial transaction. As such newspapers, news broadcasts, comic books and video games are immune from publicity rights claims unless they are used to promote a commercial transaction, in other words, they are a disguised advertisement for sale of a good or product. In addition, a second category of commercial appropriation similarly exists when substantially then entire person’s act is exploited. Thus if a news station were to broadcast all of a concert under the guise of covering that concert, it would steal the commercial exploitation of the work itself. That approach accommodates the Supreme Court decision in Zacchini v. Scripps-Howard Broad. Co., 433 U.S. 562 (1977). In Zacchini, the entire act of the Human Cannonball was broadcast on the news and Zacchini sued for damages as a result. The Supreme Court explained that free speech rights must provide balance with state publicity rights, agreeing that a cause of action for Zacchini’s right of publicity was appropriate under Ohio law. When a publisher of communicative content takes a substantial portion of the commercial work, then a fair use style balancing is essential to be sure that the communicative work has not usurped the marketplace of the commercial work. Such a test will protect the magicians, comedians, musicians, poets, and trapeze artists of the world. Depicting an athlete in a video game or in a fantasy sports league hardly usurps the athlete’s entire performance; it remains communicative rather than a product or service. It should not matter whether the depiction is accurate or transformed, for that decision is precisely an aesthetic decision inappropriate for determination by judges and courts. The Hart decision may increase the importance of the Transformative Use Test outside of California, but it does not provide a more thoughtful or more predictable distinction between free speech and publicity rights. The time for a uniform state statute is finally at hand. Garon, Jon M., Playing in the Virtual Arena: Avatars, Publicity and Identity Reconceptualized through Virtual Worlds and Computer Games (March 26, 2008). Chapman Law Review, Vol. 11, No. 3, 2008. Available at SSRN: http://ssrn.com/abstract=1334950 or http://dx.doi.org/10.2139/ssrn.1334950. New York Times technology columnist David Pogue discussed the decision last year by Tor Books UK and US to drop copy protection. It just released a statement regarding the effect of the DRM-free ebooks after one year. His column deftly discusses the tension between consumers who want the inconvenience of encryption eliminated and concerns that DRM targets lawful consumers far more than those acquiring illegally distributed copies. Although he does not address the plethora of DRM-free versions on bit torrent sites, he notes that the changes to DRM for commercial products might affect the rate of piracy, but not the existence of piracy. We had discussions with our authors before we made the move and we considered very carefully the two key concerns for any publisher when stripping out the DRM from ebooks: copyright protection and territoriality of sales. Protecting our author’s intellectual copyright will always be of a key concern to us and we have very stringent anti-piracy controls in place. But DRM-protected titles are still subject to piracy, and we believe a great majority of readers are just as against piracy as publishers are, understanding that piracy impacts on an author’s ability to earn an income from their creative work. As it is, we’ve seen no discernible increase in piracy on any of our titles, despite them being DRM-free for nearly a year. Pogue suggests but does not state outright that DRM is an ineffective strategy for reducing piracy. But he is very explicit that the point of an anti-piracy policy is to increase sales and revenue. DRM-free does not mean without cost. iTunes sells its music even though it dropped DRM. He also points out that his own books have had fared similarly in the market. If book consumers thought that everyone in the household could easily read the same book (in the manner that a family can share a physical book), it might be more willing to spend money to own the ebook. For works that have no physical cost, the increase in unauthorized copies is not the right metric. The right question is whether more customers will purchase the work. If more copies are sold, the work is more successful, even if more copies are also pirated. Pogue makes another strong point that the ease of the transaction directly impacts sales. “Friction also matters. That’s why Apple and Amazon have had such success with the single click-to-buy button. To avoid piracy, it’s not enough to offer people a good product at a fair price. You also have to make buying as effortless as possible.” High transaction costs are reasonable only for expensive, infrequent purchases. Weight is a normal force on friction; only weighty purchases should have high friction. Finally, Pogue addresses the pricing of ebooks. Frankly, he is more generous to the publishers than I would be on this issue by acknowledging the costs associated with “author advance, editing, indexing, design, promotion, and so on” but like the music industry, the investments are declining. The public is likely to value the fair price point of an ebook as a percentage of its physical counterpart. If the physical copy has a secondary market in the used bookstore, then the loss of resale also needs to be factored in for the consumer. Otherwise the consumer is only paying for the convenience of instant access, and if the instant access is undermined by cludgy DRM, there is no value to be had. Tor never says it has become more profitable, but the company does relish the role it is taking in leading the publishing industry towards a more consumer-friendly business model. The move has been a hugely positive one for us, it’s helped establish Tor and Tor UK as an imprint that listens to its readers and authors when they approach us with a mutual concern—and for that we’ve gained an amazing amount of support and loyalty from the community. And a year on we’re still pleased that we took this step with the imprint and continue to publish all of Tor UK’s titles DRM-free. So the lesson from Tor is simple – for low-cost impulse purchases DRM doesn’t add value. High quality, fairly priced, and easy to access works will continue to attract a growing market. These are the points of emphasis and differentiation for the marketplace. DRM may be a legal solution, but it is not a sound business strategy. The Pew Research Center’ Internet & American Life Project announced two potentially interrelated studies focusing on civic engagement and library usage. 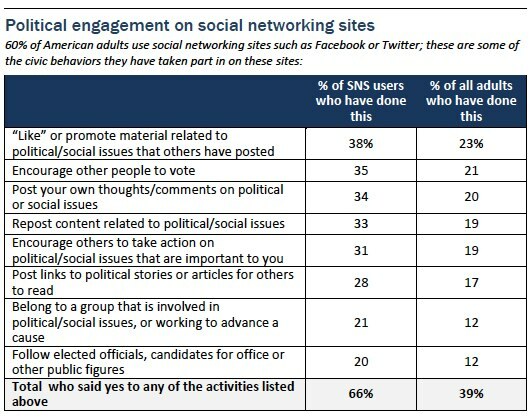 While social media has become increasingly important, it has not displaced real-world environments for civic interaction and engagement. A second study found that “94% of parents say libraries are important for their children.” 84% of parents with children under 8 say libraries are “very important.” The importance and actual usage of libraries declines for non-parent adults. Unlike the social media study, however, libraries are more important to those with lower median incomes, because of the resources the libraries provide. Moreover, libraries have become a critical component of the social media landscape because of the computer and technology services they host. Since reference services and non-lending activities at libraries remain an important factor for libraries, the future of libraries is not all bad. At the same time, however, even for adults with children, 81% borrowed books compared to the 9% who borrowed e-books. Literacy programs and coordination with schools remains an important part of what libraries do. The two studies also suggests that as libraries reduce their emphasis on physical book collections as e-book lending grows, they can add soft-seating space and serve as a physical home for the growing civic engagement; a place home to both the public and the technology that will make it a natural focus for community building. Together, civic engagement and civic spaces will continue to thrive both online and in person so long as we as a society invest in what matters most. As always, the children will lead. The full report on civic engagement is available here. The full report on libraries – “Parents, Children, Libraries, and Reading” is available here.